Julien Labro (accordion, accordina); Evan Perri (guitar); Carl Cafagna (saxophones); Paul Brady (rhythm guitar); Shannon Wade (acoustic bass). More than seven decades after the innovations of the Quintette du Hot Club de France, featuring guitar virtuoso Django Reinhardt, combos called Hot Clubs carry on the gypsy jazz sound around the globe—in Tokyo, San Francisco, Seattle, Sweden, Norway, Austria, and many other locales. 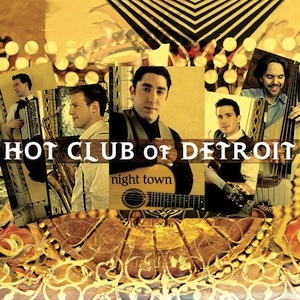 None, however, offers a fresher take on the tradition than does the Hot Club of Detroit, led by fast-fingered Reinhardt disciple Evan Perri. Unlike the instrumentation of original Paris-based quintet, comprising Reinhardt, violinist Stephane Grappelli, two rhythm guitarists, and a bassist, the current Hot Club of Detroit is made of guitarist Perri, accordionist Julien Labro, soprano and tenor saxophonist Carl Cafagna, rhythm guitarist Paul Brady and bassist Shannon Wade. The fibrous accordion tones of Labro, a native of Marseilles, France, links the Detroit quintet to the French musette style from which gypsy jazz partially sprung, while Cafagna’s robust saxophone work introduces bop and post-bop elements to gypsy jazz. © 2008 Mack Avenue Records, Inc.